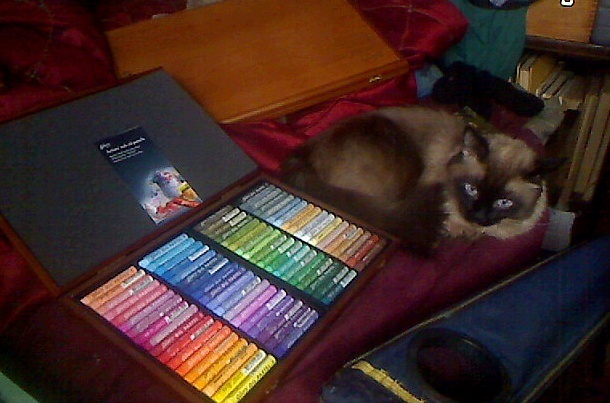 My cat Ari approves of the new Gallery Artist Extra-Soft Oil Pastels wood box set of 72. Gallery Artist Oil Pastels are not the same product as the company's older student grade product Gallery Oil Pastels. These are so much better that you can tell the difference in the first stroke. Like Caran d'Ache Neopastel, these artist grade oil pastels are AP non-toxic. They do not include genuine cadmiums, cobalts or other mineral pigments requiring a CA toxicity warning. They're softer than Neopastel and perhaps softer than Holbein. Look for "Gallery Artist Extra-Soft" on the packaging. It is different, the covers of the cardboard box sets have different graphics and the price is higher on the Gallery Artist oil pastels as it should be for an artist-grade product. You get what you pay for. In this case, what you get is a crumb-free soft application. With most oil pastels, a firm stroke generates crumbs of color that bounce all over. Often they wind up on top of other color areas where they don't belong. They always need to be removed or blended in later with a Colour Shaper or the tip of a stick or your finger. I've got an entire article on handling crumbs on this site because the problem exists for all the student grade brands and many artist grade brands. Gallery Artist oil pastels have less crumbs. Practically none. What few crumbs I saw were very tiny grains of pigment that could be blown off. This is an amazing convenience in itself. These oil pastels are extra soft. That's in the official name of the product, Gallery Artist Extra-Soft Oil Pastels. Look for it on the box, because that's half of the main selling point for this brand and the student grade ones can be distinguished by that phrase. They fall somewhere between Holbein and Sennelier, they are in the Extra Soft sub-category of oil pastels. Very creamy application, in some ways similar to Senneliers but just a little more firm. They are a little softer than Caran d'Ache Neopastel. Round wrapped sticks are a little easier for me to handle than the unwrapped Holbein sticks. I don't like getting the color all over my hands, so the wrappers are handy. Because they're so soft, it's very easy to push color into very small details using tools like scrapers, Colour Shapers or palette knives. They layer and blend beautifully. The lack of crumbs leads to great ease of working. I'm not always stopping to flick or blow or tap off some gob of mud from another area while I'm painting with them. Their softness allows a painterly application or even mixing on a palette if you prefer to make combination colors. 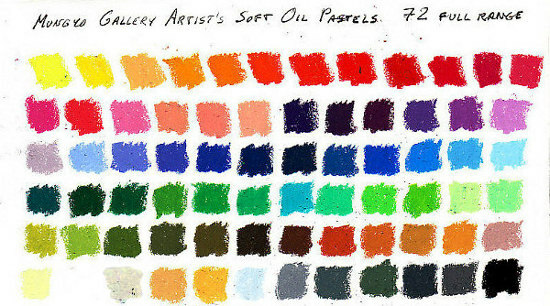 I like the 72 color range of the Gallery Artist oil pastels. Intense colors are spread evenly around the spectrum with significant pinks, peach and other useful light tints represented. The earth tones, grays and muted colors are excellent, with plenty of variety in muted hues so that you're not stuck layering too much if all you want is a light blue-gray or a brownish green. You can use light blue gray, brownish green or your choice of earth yellows and oranges as mixing colors, something I find helps a lot in balancing the more intense spectrum hues. A good choice in earth yellows is very handy for mixed greens. When you modify the muted greens with warmer earth yellows like Ochre, Golden Ochre (similar to Raw Sienna) and Burnt Orange that can enrich a landscape and make atmospheric or aerial perspective much easier. There's even a gorgeous light ivory yellow color over in the neutrals row in the box right next to a grayed, pinkish lavender that I'm going to enjoy in everything from landscapes to portraits. Whoever planned the palette for Gallery Artists oil pastels is familiar with the colors professional artists and designers use all the time. The spectrum intense colors artists expect in oil pastels are all there, along with a few good darks and the most important neutral and muted colors. I'm very happy with the set for this. Of course I had to put it into use immediately right on the same page with my color chart. It's one thing to observe that the neutral colors are great and have a nice variety, another to sketch a beige cat who shades to black! Ari became the best subject for my first field test of the Gallery Artist oil pastels. The price for Gallery Artist Oil Pastels is close to Erengi Art Aspirer. Which one is less will depend quite a lot on sale prices. Both are available from Jerry's Art Supplies and fill different needs. Some will prefer the softer texture of Gallery Artist oil pastels, others the firmer texture of Erengi Art Aspirer. 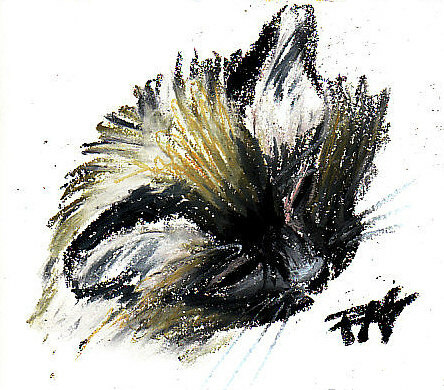 Many artists will use different brands for different layers, using firm oil pastels on the earliest layers and softer ones after the paper starts losing its tooth. These two brands would work very well together for a beginner in small sets. They're both a bit less expensive in sets than in open stock and the contrasting textures allow different effects. 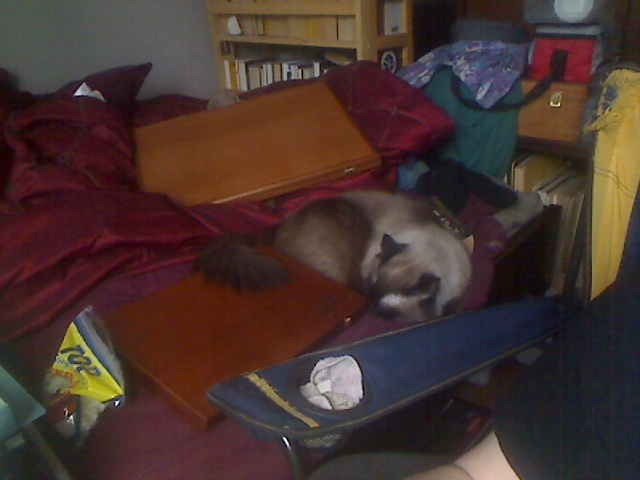 I don't know about the cardboard boxes since I purchased the full range wood box set on sale. It's a good solid wooden box with grooved styrene trays inside. Without space between the sticks, that kept the size of the box reasonable so it'll be easy to bring along if I'm painting outdoors. It's 9 1/2" x 14 1/2" x 1 1/4" thick, doesn't weigh too much and stacks easily with a sketchbook. I love these pastels. Try a small set or email Jerry's Artarama for a sample. We have a new brand of Artist Grade oil pastels and they are every bit as sweet as the other artist grade ones... with their own happy crumbless specialty, their extra soft texture fills its own special place in my palette.